Smoking has rapidly become one of the massive threats to our human health. Not only smoking affects the direct user’s body, many non-smokers ranging from adults to vulnerable children are being exposed to secondhand smoke, negatively impacting various individuals indiscriminately. When a user inhales cigarette smokes, 60 or more known carcinogens enter their lungs (Hilton), causing cancer, as the carcinogens are the substances that can cause cancer in living tissue. Cancerous cells can metastasize, meaning that they can continue to spread across not limiting to the respiratory system, but also across the whole body and increasing its damage. The risk of the disease is also determined heavily by the amount of time the users were exposed to the toxin, making heavy smokers are more likely to develop tobacco-related cancer with higher severity. As a solution to this issue, e-cigarettes are being introduced as an alternative to conventional smoking. Unlike normal cigarettes, e-cigarettes are devices that emit either nicotine or non-nicotine liquid as a mist through vaporizing them, which then the users could inhale. E-cigarettes also do not contain any tobacco, nor it causes combustion or produces tar, smoke, and carbon monoxide (Ross). This also means that no secondhand smokes are being produced and that it does not affect the non-smokers around. E-cigarettes are relatively safer than regular cigarettes. However, there have been many concerns over if e-cigarettes are actually safe in general, or that if they are effective in reducing the number of smokers. While e-cigarettes are known to be smoking cessation tool, it is still unclear whether they are effective or not. A research done to investigate on the effectiveness of e-cigarettes as a smoking cessation tool concluded that “E-cigarettes are no more or less effective than nicotine replacement therapy for cessation”, along with stating how the long-term effect of e-cigarettes are still unknown (Ghosh). While it is safer than conventional smoking, e-cigarettes are not innovatively effective as a smoking cessation device. Moreover, there has been an ethical issue of how e-cigarettes appeal to adolescents, and could potentially increase the amount of actual amount of young smokers, with e-cigarette becoming the ironic ‘gateway to smoking’ for minors. Teenagers who have a habit of vaping had a 3 times higher concentration of toxic compounds in their body than non-vaping teenagers (Cohut). E-cigarettes are creating misconceptions that vaping are completely ‘non-harmful’, while in fact it still contains toxins similar to conventional cigarettes and could affect their health nonetheless. In conclusion, E-cigarette is not an effective and healthy alternative to conventional cigarettes. although e-cigarettes are considered to be much safer than conventional smoking, the actual effect of a smoking cessation device still has not been shown to be positive. E-cigarettes are also starting to appeal to younger targets, which can be a major concern as the nicotine could impair brain development, and also influence to be attracted to other drugs. I believe E-cigarette is definitely a safer alternative however, the laws must be regulated stricter to forbid teens being exposed to e-cigarettes, and must correctly state its potential harm rather than marketing just as a ‘healthy’ alternative. During the session we had with the kindergarteners, I’ve experienced many things in a short amount of time. In this session I’ve read books and stories to a little kindergarten girl who was my buddy. Although I was experienced in reading books to little students from past similar sessions I had in the past few years, I did felt self conscious about my ability to talk and read books with the kindergarteners. Although I had some slight concerns, when I met the little kindergarteners they were all genuine and welcoming, which made me feel more comfortable playing with them. My buddy was an energetic little girl who was very advocate and communicative. Although she was slightly shy at the start, after introducing one another to each other she become more confident and comfortable talking with me. She engaged in many conversations and freely expressed her own opinions and feelings during the sessions. When we were reading the stories, she commented on the pictures and gave her opinion, as well as asking for mine which I thought was one of strength as a learner. She was already able to be open-minded and ask for others opinion or comments. During this session I also worked on being open-minded and caring towards my buddy, as I understood how this session was also risk-taking for her as well. Whenever she finished reading a book, I would always ask which book she would like to read next and let her have choices rather than being restrictive. Through this action she felt more comfortable talking with me and she gladly shared her favorite books with me. I also tried to support her as much as possible by being caring and showing genuine compassion towards her. During the session she accidentally knocked some books down to the floor, which made her feel guilty or culpable about the mistake. Instead I supported her by telling her that ‘it’s okay’ and giving encouraging comments. In the end she and I became great buddies and gave high fives and hugs in the end. This session was stimulating and every experience I had with my buddy was genuine and valuable for me. I hope I can have an another session with her again. Why does Magali want to buy something new? She wants to buy new clothes for Sophie’s birthday party to look attractive. What is Hélène going to wear? Why? Jeans and t-shirts, since its easy to wear and comfy. What type of clothing is Magali looking for? Something original and not too expensive. What outfit does Magali like? la première jupe que la vendeuse propose. Vous trouvez? Mais, je ne sais pas quoi mettre avec. Je cherche quelque chose pour aller à une fête. Bof. Ce n’est pas tellement mon style. In I&S class, we used ‘gap minder’ to compare two countries with different variables such as the birth rate, population growth, GDP per capita, life expectancy etc. I compared China and Sweden with different variables in different time. There are some interesting difference between two countries, and by looking at the statistics, you can see how the country was at that time. I first looked at Child mortality rate and child fertility rate. They interrelate, since you can find out how many child grows up as an adult after they are born, and can find out if that country is innovated enough to keep the kids alive. In 1800, both China and Italy had high fertility rate and high death rate of child from 0~5. Even though Italy is much smaller than China, they had 457 child dead per 1000, while China had 417. 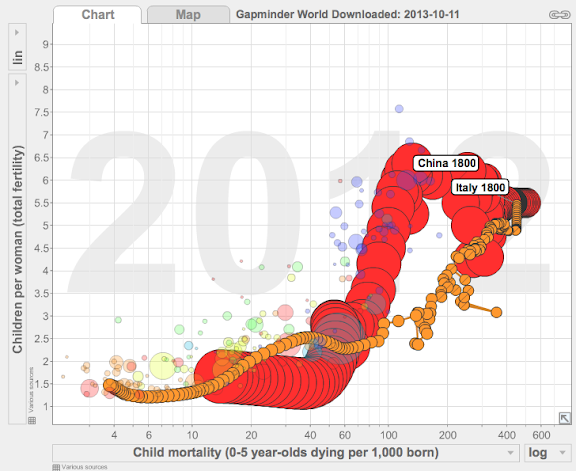 Italy even had more higher child death rate than China. I believe that the reason why both countries had high fertility rate, is because they wanted to grow the population and they needed to make many babies so the population won’t go down even if some dies from sickness or starvation. In 2012, Both countries had lower child fertility rate and child mortality rate. 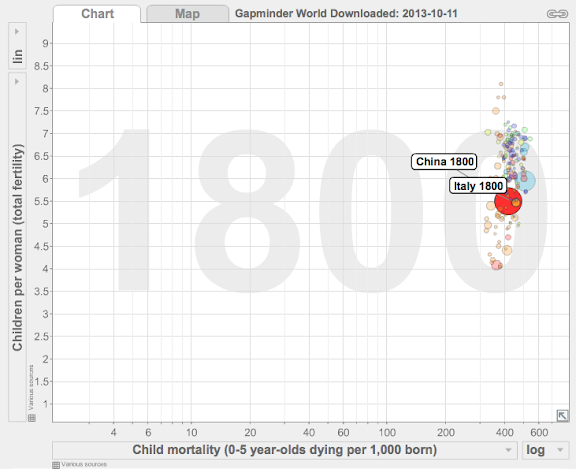 Italy had now 3.8 child death per 1000, while China has 14. Looking at Italy’s data, the both child fertility rate and mortality rate were going down steadily, while China had a lot of up-downs and weren’t stable. I believe this is because of the cultural revolution in 1960 which made the child mortality rate go down, and the 2 child policy in 1980 that made the child fertility rate go to 2. I then looked at GDP per capita and literacy rate. They interrelate, since if you are highly educated and are able to read, you can make money in better companies which makes the GDP go higher. 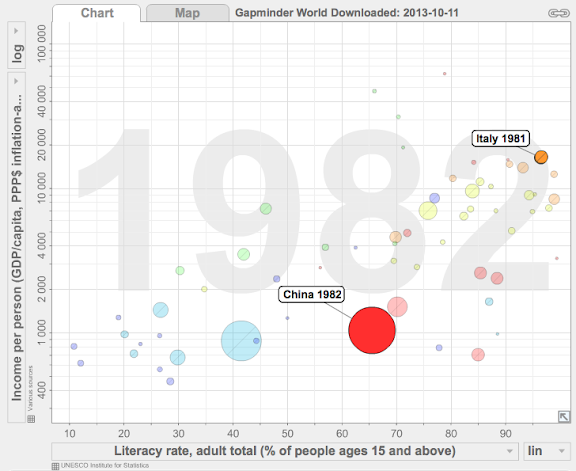 In 1982, 66% of China were able to read and 96% of Italy were able to read. Italy is very small compared to China, and even 4% couldn’t read, there aren’t that many. But China, was very big compared to Italy. 36% of China couldn’t read, which means that one-third didn’t have a literacy education. Also the GDP capita in China were very low compared to Italy. I believe that this gap shows how Italy were one of the MEDC when China were one of the LEDC. China is a very big country, and I believe that there is a huge gap between the poor and uneducated group, and the wealthy and educated group. The poor citizen didn’t have enough money to pay them selves education, so they worked in a factory where no educational knowledge were needed. Those factory payed very little amount of money which made the GDP per capita go low. 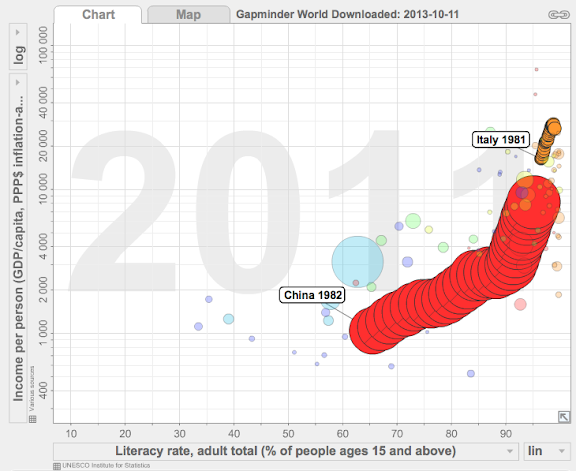 In 2012, China were catching up by raising the GDP per capita and the literacy rate, but not as far as Italy. Italy now became one of the most developed country, with high GDP and high literacy rate. This shows that the citizen has well education which creates more profit when they work in companies. I looked at HDI and life expectancy. They interrelate, since if theres higher HDI, its a better place for you live, which means your life expectancy goes higher. 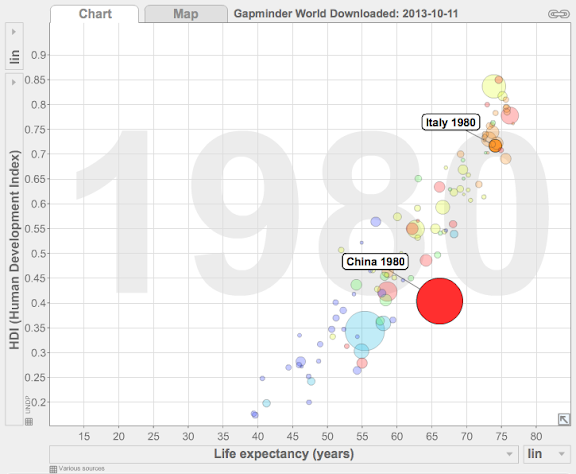 In 1980, China’s average life expectancy was 66, and Italy’s average life expectancy was 74. Italy clearly had a higher HDI than China, which proves that Italy is MEDC than China. People in Italy had longer life expectancy, meaning that they were wealthy enough to afford the food, medicine, and other things they need in order to live healthy. China, on the other hand had a lower HDI and life expectancy. I believe this is because China has a huge population, and because theres many of them, theres not enough food, medicine or wealth for everyone to live healthy like Italy. Also many people work in mass-producing factories, which are unhygienic environment with low payment and many people who weren’t rich enough to go to school works because it doesn’t need any educational knowledge. This is one of the problems China has a low HDI. Mostly everyone in Italy are highly educated, lives in a clean environment with medicine to cure disease, and has highly decent amount of money paid. 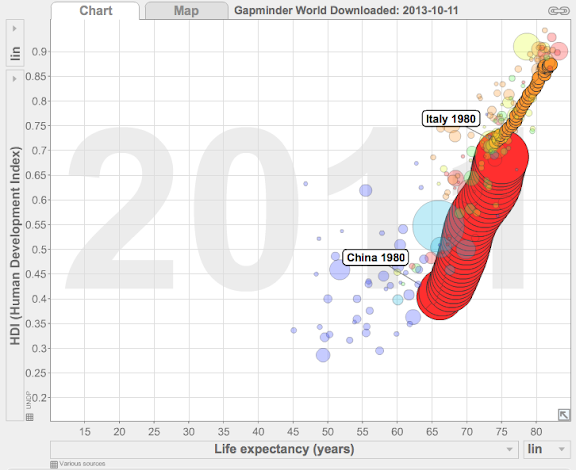 In 2011, China’s HDI and life expectancy grows, but still aren’t no where close to Italy. In fact, China now is how it was like in Italy, 1980. Italy is now ranked as one of the MEDC, and still continues to grow their HDI and life expectancy. You can see, from looking at these statistic shows why some countries are ranked as LEDC and some countries ranked as MEDC. There are gaps between countries, some small some big. It may be because of the disadvantage of their environment, population, government, wealth etc. But these data can be inaccurate and deceiving. These are just the average, and China is a very big country. Some parts in China can be highly innovated just like Italy, while some parts aren’t very developed. I believe that these datas can help us understand their history, but also misunderstand the truth. Hello, I made a video about tech and student tech team. Hello, today i’m going to be talking about SMART goals. And it is a goal with those 5 things. My Community goal is to try and create a parent involving community in Student Tech Team. When I mean community, I mean creating videos and blog posts to remind the parents about things in YIS, or even teach them about things in technology they might have problems with (like veracross, gmail, or other social network). This includes me and the parents, but also the other students in Student Tech Team to help me out, and maybe even the teachers might involve in this community. This goal is important because parents are included in the YIS community and we should help them when they have problems too. I want to work on these projects when we have Student Tech Team every week, and I want to finish each small projects every 1 and a half month. This goal might be hard, but its not impossible. I have to ask some parents what problems they have first though. I want to continue making small projects until end of 7th grade and see if I achieved my goal and if I should keep on going. My Academic goal is to try and achieve the academic award. This is important to me since I work very all the time to score a high grade on my classes and for me; achieving the academic award is a honorable thing and It shows me that I worked hard that year. This goal includes me and the teachers. Whenever I have a test, I will always review beforehand so I will be ready for the test, and whenever I have to submit a work in, (which is graded) I will always check the TSC and see if I did my best in the TSC. This goal might be a bit hard but I still think its not impossible since I achieved the academic award last year too. I will know if I achieved my goal or not in the award ceremony next years spring. Me, Athul, Haruna, Tsuyoshi and Kenryo made some minecraft stuff for humanities and its related to Marco Polo. Hope you enjoy. To start this, I will try to stop talking and listen to other peoples opinion and let them have a chance to talk. I think being positive is really important thing to be at school. Also if theres anything I don’t like to do, being positive helps me to go through and even starting to like it too. Theres a lot of benefits about being positive and It really helps myself and others too. I will try to talk with a lot of people and try to make them laugh and cheer up. Positive FTW! To achieve this goal, I will have to not use computer before sleeping because it makes your brain working and it keeps you awake and set an alarm so I can wake up. I will also try to finish homework and review on tests early so you don’t have to work at night. Sanks a lot for listening. Hai. Do you like math? No? I don’t care. were going to talk about measurements. Our unit question is is: “How can we calculate using measurement?”. We can calculate the area of something by measuring. If you want to find the area of something, you measure the height and width and you multiply them. We also use measurements in different environments. We obviously use rulers and other measuring instruments in school, but there are some other places we use those. Like people who work in architecture use measuring instruments all the time. They use rulers to measure the height, width, length, and they use scales to scale and see how heavy the materials are. Many people uses watches and clocks to see the time. In P.E we use stopwatch to record our time. Even in hospitals the shots have lines to measure and they also have thermometer to measure your temperature. We have some questions about measurements too. What are the different units of measurements? How many are there in the whole world? How do you find the area of a circle? We know how to find the area of a square. But what about circles? How do find the area?Another question is: Why do we need to measure things? Why do we measure? What would the world be without measurements? Now i’m going to show different types of units. First of is degrees. Degrees are used to measure temperatures or angles. °C (celsius) and °F (fahrenheit) are used to measure temperatures. But ° are used to measure angles. For example: 90°, -15°C and 50°F. Another one is cm. This unit is very commonly used and they are used to measure width, height and length. Another common units are mm. Mm is equal to one tenth of a cm. Now i’m going to teach you how to find the area of a square. First you find the length and width of a square. Lets pretend the length and width of our square is 10cm. The height and the width is the same since its a square. Then you multiply them. 10 x 10 is 100 so the area for our square is 100cm^2. Now i’m going to show how to find the area of a rectangle. First we have to measure the width and length. Lets pretend the width of our rectangle is 10cm the length was 5cm. Then you multiply height and width together. 10 x 5 is 50 so the area for our rectangle is 50cm^2. Were going to try something trickier. I am going to show how to find the area of a triangle. First you have to find the height (base to the tip of the triangle) and the base. Lets say our base was 10cm long and the height was 11cm. We are going to multiply the height and the base together. 10 x 11 is 110. Now we are going to divide it into half. 250 divided by 2 is 125 so the answer is 110cm^2. Now i’m going to show how to find the area of a 3D rectangle. First you have to measure and find out the height, length and width. Then you multiply all 3 of them together. And BAHM, you have the area. Make sure to put ^3 in the end. …What. How are we supposed to even classify measurements as good or evil?…. I have no idea. If you want to find out how to get the area of a circle, go here because i’m too lazy to show you how. …And now I pass out.